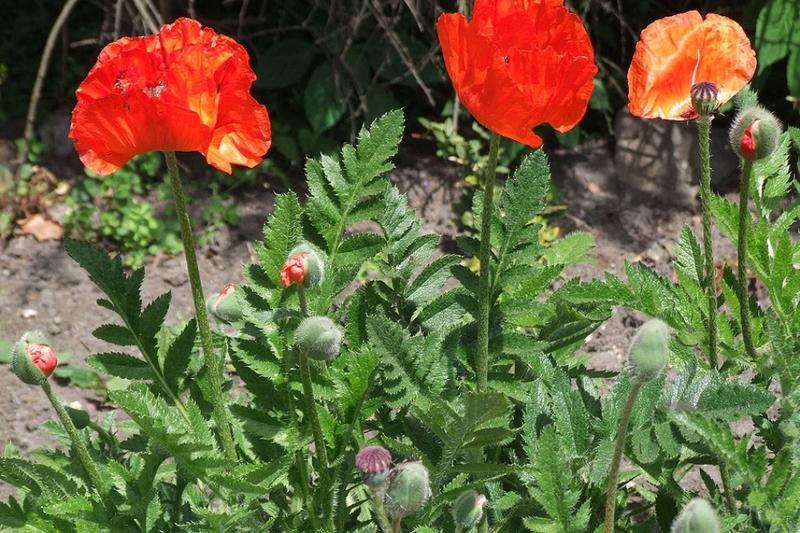 Oriental Poppy (Papaver orientale): growing, planting, caring. The biggest of all poppies ! Full description for Papaver orientale not yet available. The oriental poppy is a poppy with very large flowers. It is a perennial herb whose stem can reach up to 1 meter, with white to red flowers with a black center. The petals are large and wrinkled, and the flowers reach 20 cm in diameter. The capsule, round and large, contains many seeds. Poppy cultivation is easy. Once sown on well-drained soils, it will cover them very quickly. On the other hand, the poppy,does not support transplantation. It reproduces only by sowing. Find a dry, well-drained spot in your garden. Poppies adapt perfectly to calcareous and poor soils - but they need sunshine to ensure a beautiful flowering, and moderatly wet ground. Sow in April, when the soil has warm up, or you can sow in the fall for early flowering. In heavy soil, you can mix sand with it to lighten and drain better. Moisten the soil by watering it in fine mist, then sow it just on the whole surface. Rake lightly, then tamp the soil with the back of the tool, taking care not to create puddles in which the seeds would accumulate. Keep the soil cool until emergence of the seedlings. Thinning may occur when the plants have some leaves, if you notice spaces of less than 5 centimeters between two subjects. The poppy does not fear much, and especially not drought. During the emergence of the seedlings and the first weeks, water in very fine mist - your seedlings are very fragile! If you have tried the adventure of poppies in tubs or pots, water them during the summer - in the open soil, beyond the first month, it is perfectly useless! The poppy multiplies itself from one year to another thanks to the spontaneous sowing, but if you wish you can harvest some seeds, to sow elsewhere or to give it to someone. At the end of flowering, you will find in the center of the flower a capsule: this one, once dry, contains a multitude of small seeds that are black. Warning ! Let the flowers dry before harvest: green, they would not be ripe. The poppy may be prone to aphid attacks. A water spray with baking soda will be suitable (two liters of water, a spoon of bicarbonate, a little soap, pschit!) In moist soil it may be subject to powdery mildew - in this case, dry out, or move it the next year.